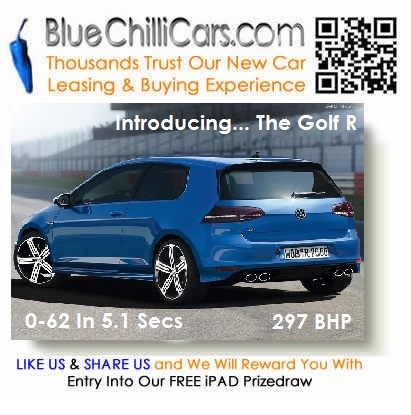 Blue Chilli Cars have a fantastic business lease deal on this very latest high performance Volkswagen Golf R.
The “R” is capable of 0-62 in 5.1 seconds using its 297 BHP 2.0L turbo charged engine. It comes with All Wheel Drive and offers fantastic handling and performance. The feedback we are getting from our customers is that this is an outstanding car at an unbelievable price. To find the best deal for you, see our reduced business lease prices here. IF YOU HAVE NOT ALREADY done so, then please LIKE US and SHARE US using one of the links below – this will qualify you for entry in our draw to “Win An iPad Mini 16GB”. For more details of our iPad Competition – click here. View full details at our main website – view here . . .